Judging by Huawei's latest smartphone unveiled in Beijing today, it looks like someone has taken a leaf out of HTC's playbook. The Honor 6 Plus -- a follow-up to the reasonably priced Honor 6 -- is all about its dual rear 8-megapixel cameras, which claim to boost the effective pixel size to 1.98 microns for improved sensitivity and thus cleaner images. By comparison, this almost matches HTC's 2-micron UltraPixels. And similar to HTC's Duo Camera feature, Huawei's dual-lens setup lets you refocus the captured photos, adjust their simulated aperture (you can go from f/0.95 all the way to f/16) and apply fun filters like tilt shift, sketch and comics. 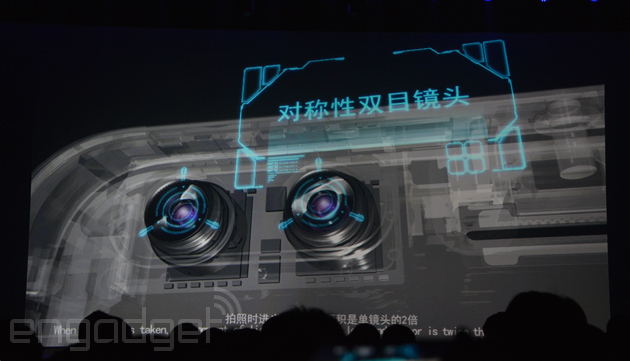 Even the front-facing camera has an 8-megapixel resolution to give you the "888" blessing (it implies "triple the fortune" in Chinese), along with the usual beautification feature for photos and videos -- both recording and live chat. Despite stuffing three 8-megapixel cameras into the phone, Huawei didn't make much compromise elsewhere. At least that's the case on paper, anyway. The metallic device comes with a vibrant 5.5-inch 1080p JDI negative LCD, Huawei's own Kirin 925 octa-core chipset, a low-power I3 coprocessor (for fitness tracking), 3GB of RAM, up to 32GB of internal storage, a 3,600mAH battery, NFC, TD/FDD-LTE Cat 6 connectivity and dual-SIM slots -- one of which doubles as a microSD tray, supporting up to 128GB of expansion. Like its recent sibling devices, the Honor 6 Plus has an infrared transmitter to let you control your TV, Hi-Fi system and air conditioner. Just to give its competitor a quick jab, Huawei pointed out that its latest phone is lighter, runs cooler, has less bezel space and yet has more battery juice than Apple's similarly-named iPhone 6 Plus. On the software side, the Honor 6 Plus runs a heavily-customized EMUI 3.0 Android ROM which has some nifty features, especially when the screen is off. For example, you can double-click the volume-down button to instantly take a photo; double-click volume-up to start recording a voice memo (great for us tech reporters); and draw custom gestures to trigger your desired apps. As part of the package, Huawei is offering 100GB of lifetime cloud storage, free access to over 8 million WiFi hotspots globally (7 million of which in China) and the company's own SoftSIM data roaming subscription service (about 80 cents per 20MB or about $4.5 per day; commencing in 2015 Q1) to Honor 6 Plus users. Alas, these services are likely limited to users in China. As before, pricing isn't a concern here. The Honor 6 Plus will come in two editions: the 16GB, 3G-only and NFC-less version will cost just CN¥1,999 or about $320 unsubsidized, and you can get it in either black or white. The 4G premium edition, meanwhile, is priced at CN¥2,499 or about $400, and you get an additional gold color option.